The first side of the leaflet has a landscape table, of three columns (named Conservative, Labour, Liberal Democrat) and various rows, with the title COMPARING MANIFESTOS. On the left side of the title, there are pictures of Dylan Macmillan and Ari Suchet both looking befuddled in muted colours, while on the right of the title, a photo of Meredith Hansen-Charles and Graham Adiputera confidently presenting the Liberal Democrat manifesto in brighter colours. Each row gives the content of the respective manifestos on the given topic (with column splits indicated here by semi-colons). The first few rows simply have ticks and crosses, while the last couple go into more detail. 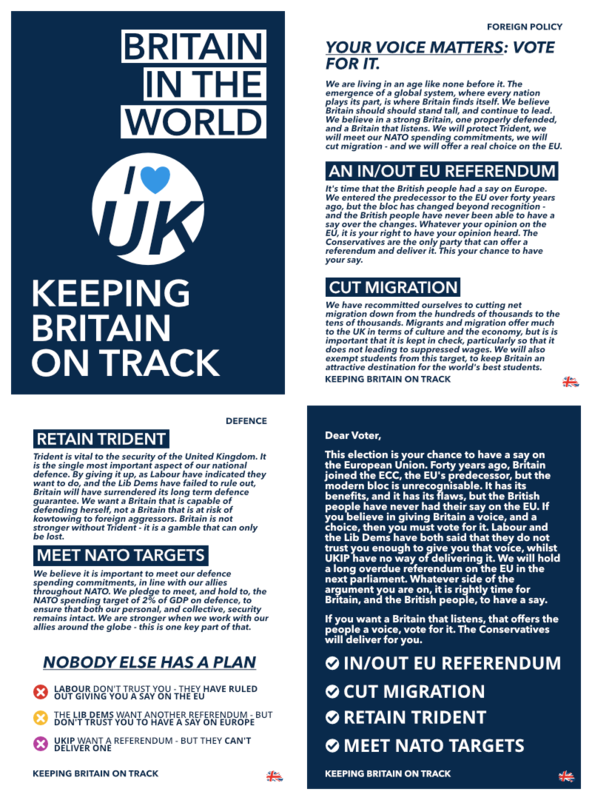 On the other side of the leaflet is a page designed in a portrait style. The header indicates that this is a Liberal Democrat FOCUS leaflet, and the largest picture will be of MHC with the local candidate and activists. Space exists on the side for the local party to include a short local story and, if it is wise, a bar chart of 2010 results showing how the Lib Dems are well-placed to win or hold the seat. If the local party does not use that space, it is taken up by further pictures, including one of the local candidate with Graham Adiputera. At the bottom of the page there is both the legally required text and a form that can be cut out, allowing the recipient to get in touch with the candidate, either to discuss issues, to request GOTV support, or to offer support. I am writing to you today because I am pleased to endorse [Candidate Name Here] - the brilliant local candidate for your area in the general election on April 10. A steadfast and dedicated campaigner for political reform and social justice, they will be a strong voice for [constituency name] in Parliament, standing up for your needs and interests even if the two big parties stand by and shrug. 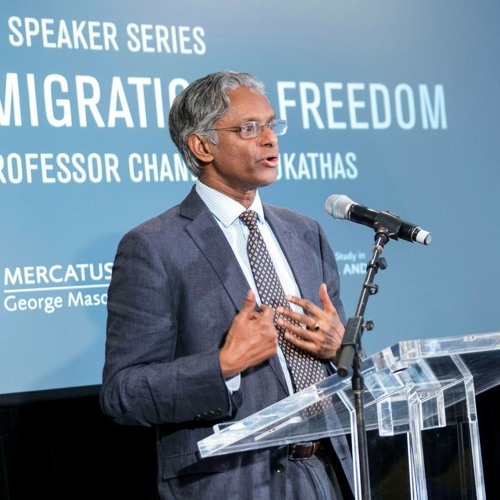 We have a brilliant opportunity to change politics here, to force politicians to truly care about liberty and individual opportunity, to hold them to the highest standards of ethical conduct and honesty, and by voting for candidates such as [candidate name here] we can seize that opportunity together. The Conservatives and Labour have repeatedly taken power for granted, acting as if they are entitled to millions of votes and dozens of seats. This sorry state of affairs reached its peak this election, with two sorry manifestos that left out many highly important issues - and mangled the issues they did tackle. 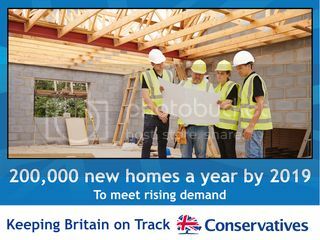 Did you know, for instance, that the Conservative homebuilding pledge will be met even if current annual rates of homebuilding halves? That’s not good enough. That’s worse than the status quo. And the leaders provide no leadership. Dylan Macmillan has, for example, flip-flopped on political reform, going from supporter to opponent, in the course of a few months, abandoning the issue the moment it became politically inconvenient. Ari Suchet, meanwhile, shows no grace or kindness to those who disagree with her. When a political opponent died, she publicly said “who cares?” That’s not good enough. These people need to be held to account. The Liberal Democrats will do that. It is the Liberal Democrats who are providing ideas and confronting problems head-on. We are the ones providing true leadership, accepting the duty politicians have to put country before party. On one side of the leaflet, there is a large portrait photo of the local candidate, with local activists, flanked by Meredith Hansen-Charles and Graham Adiputera. There are options for the local party to include text boxes or further photos on the side, as well as a space for bar charts to make the argument that the Lib Dems can win here but certain other parties cannot. 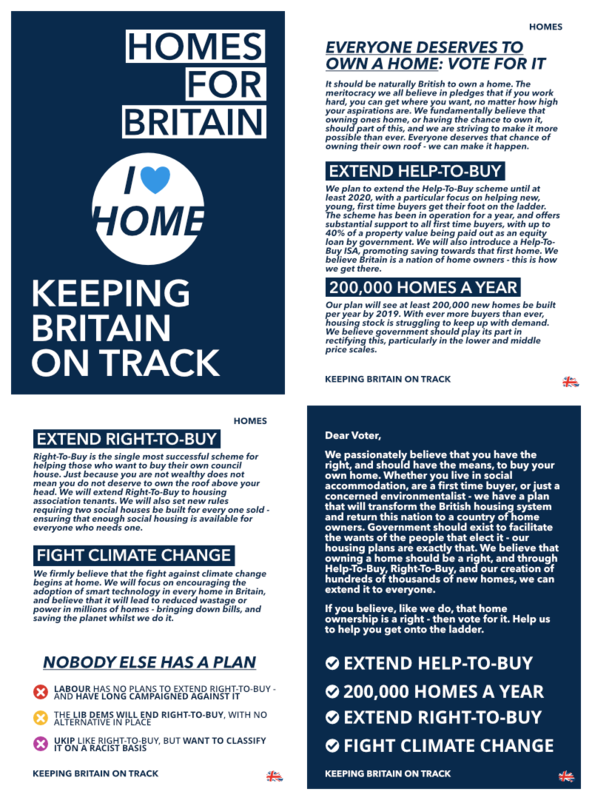 The candidate, Hansen-Charles and Adiputera are all holding copies of the manifesto, with the words “SECURING BRITAIN’S FUTURE” and “VOTE [CANDIDATE NAME] ON 10 APRIL” at the bottom, the large text in official Lib Dem colour. On the other side, there are the same options for the local party to include text boxes or further photos on the side, as well as a space for bar charts to make the argument that the Lib Dems can win here but certain other parties cannot. There is also, at the bottom, both the legally required text and a form that can be cut out, allowing the recipient to get in touch with the candidate, either to discuss issues, to request GOTV support, or to offer support. Residents of [constituency name] need a strong local voice for them in Parliament, and it would be my honour to provide you with that voice. As your MP, I would be an unwavering advocate for the needs and interests of [constituency name], fighting for the local economy and to protect local services. This election, we are told that we face a choice, between a divided Labour party and a scandal-tarred Conservative party, between economic recklessness on one hand and callous disregard for those left behind on the other. Neither choice offers much change in the way of how politics is done. The truth is, there is a third option available. The Liberal Democrats have a bold and visionary economic policy, that will get the deficit under control while making necessary investments in our future, that will share both the burdens and opportunities of economic reforms fairly, that will allow all regions of the country to prosper and all individuals the opportunity to succeed. End the public sector pay cap, increase the tax-free personal allowance, and build 300,000 homes per year. Embark on a bold new economic strategy that will see the deficit fall, debt get under control, and new investments in helping small and medium businesses thrive. Check at our manifesto at [insert tinyurl here] and please get in touch if you’d like to discuss how it would help you and others in [constituency name]. THE TORIES AREN’T THE ONLY NASTY PARTY. 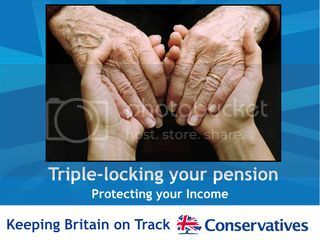 VOTE LIBERAL DEMOCRAT ON 10 APRIL FOR TRUE COMPASSION. Legal text, and information on volunteering and donating, at the bottom - only legible to those on foot, however. Two pictures, split in half by the text, the left picture being a disorganised pile of flip-flops, the right picture being of Dylan Macmillan in muted colours looking confused looking at the flip-flops. Dark blue text stands out against the white background. THE TORIES HAVE MORE FLIP-FLOPS THAN A BEACH. VOTE LIBERAL DEMOCRAT ON 10 APRIL. On the left hand side of the screen, dark red tinted pictures of Ari Suchet, Tony Blair, and Gordon Brown - on the right, dark blue tinted pictures of Dylan Macmillan, Harold Saxon, and Mary Cambel. In the middle, smiling pictures of Meredith Hansen-Charles and Graham Adiputera with other Lib Dem MPs and activists. Above the pictures, the words “REJECT THE EXTREMES - ANOTHER WAY IS POSSIBLE”.